Hello, everyone! Welcome to this episode of unSeminary. Thank you so much for tuning in. I’m honored to have Brent Dolfo from Leadership Network today. I like to say Leadership Network guys are the smartest guys in the room! They’re an organization that is really dedicated to increasing the impact churches are having by networking together thinkers and doers from dynamic churches around the country. Leadership Network helps leaders in churches go from idea to action by helping them create good action plans for their ministry. Brent explores that subject with some of the key things that churches need to keep in mind as they develop leaders. The “Why?” Question. // The first thing Brent recommends is that church leaders explore the “Why?” question. Why do you want to create more church leaders? It may be that you want to plant new campuses or start up a new branch of ministry within your existing location or make an impact in your community. These are important reasons to develop leaders, but the stress from pursuing these goals can also cause the process of leadership development to be put on the back burner along the way. So explore why you are doing this in your particular church, what God has called you to do, and keep those reasons at the forefront of your mind so leadership development stays a priority. Develop a good apprenticing model of leadership. // Jesus taught his disciples how to do the ministry works He had called them to do by modeling it – then sent them out to do it themselves. Churches who are successful with leadership development do a great job of apprenticing those potential leaders. 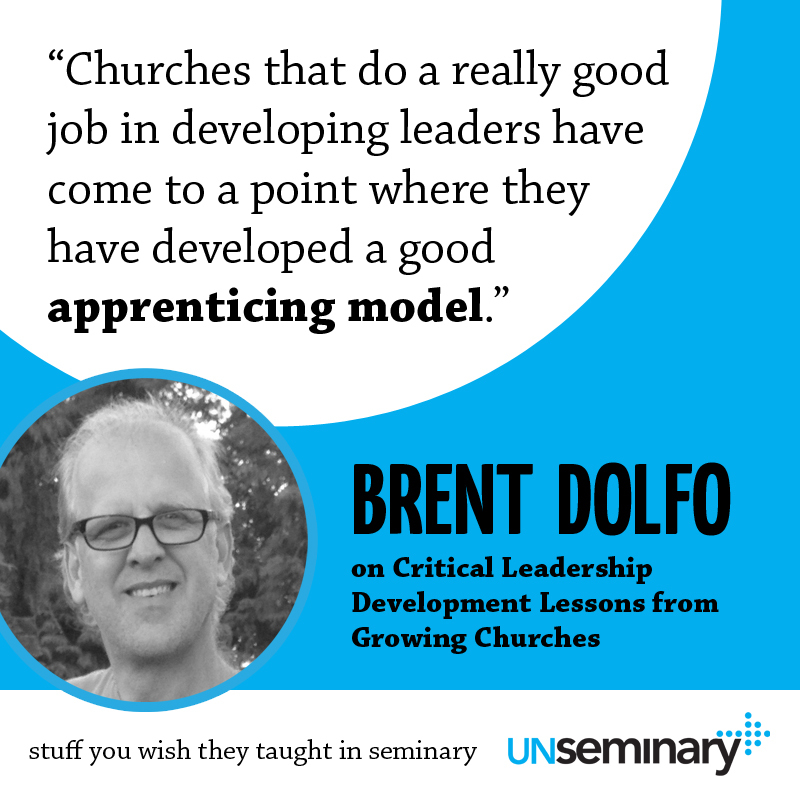 In these churches, every leader has an apprentice, Brent tells us, and that becomes a part of their culture. First, develop a model of what that apprenticeship looks like and call people into it. Let potential leaders know what you see in them and why those gifts are important. Your apprenticeship system could be a simple set of steps such as: Step One – I do, you watch; Step Two – I do it, you help; Step Three – you do it, I help; Step Four – you do it, I watch. Keep the end in mind // Brent wraps up by reminding churches that they need to be crystal clear about their mission and vision because leaders are best built with the end in mind. It’s tough to develop leaders when you don’t know what you are ultimately trying to accomplish and where the church is going. Even though people function in different roles in a church’s ministry, various departments still need a cohesive approach to leadership development so the same values across your church’s culture are being built into people. To learn more about Leadership Network visit their website at leadnet.org or you can email Brent at [email protected]. 00:42 // Rich introduces Brent Dolfo and welcomes him to the show. 01:17 // Brent talks about Leadership Network. 02:29 // Brent talks about the need to develop leaders. 04:51 // Brent highlights a church as a great example of developing leaders. 05:34 // Brent talks about the apprenticeship model. 09:07 // Brent argues that leadership development is critical to accomplishing the vision. 11:00 // Brent states that 80% of church leadership is the same. 14:38 // Brent talks about Leadership Network and how they help change leadership development culture. 16:15 // Brent talks about metrics used to measure successful leadership development. Ministries Following // Community Christian in Chicago, and Manna Church in Fayetteville, North Carolina. Rich – Well hey everybody, welcome to the unSeminary podcast, my name’s Rich, the host around these parts. Thank you so much for tuning in, happy Thursday, we hope as you head into this weekend. We know things are really busy at your church, we know you’ve got a lot going on and we’re just honored that you would take some time out to just pause and reflect and grow a little bit. So thank you for putting us in your earbuds. Today we’re honored to have Brent Dolfo from Leadership Network with us. For folks that don’t know Leadership Network, I always like to say the Leadership Network guys are the smartest guys in the room. Their organization really is dedicated to trying to really see 10X impact happen in churches. They really are trying to network together, thinkers from churches and not just thinkers but doers from churches that are making a big impact and Brent is a part of the team there, he’s Grand Poobah of all things leadership development. So Brent, welcome to the show, why don’t you tell us a little bit about… give us how you describe Leadership Network and what you do there. Brent – Yeah Leadership Network gathers large church leaders together to innovate, to think about new ideas but also how to turn them into reality, so moving from ideas to implementation, to impact. So we do two kind of gatherings. One are sort of lead team gatherings that gather around to work on a particular question and make impact, or the other group are more senior leaders, senior pastors that are gathering together to learn from one another, but the idea is how do we turn vision into action? How to take good ideas and make them into good strategies and good ministry? Rich – Very cool. 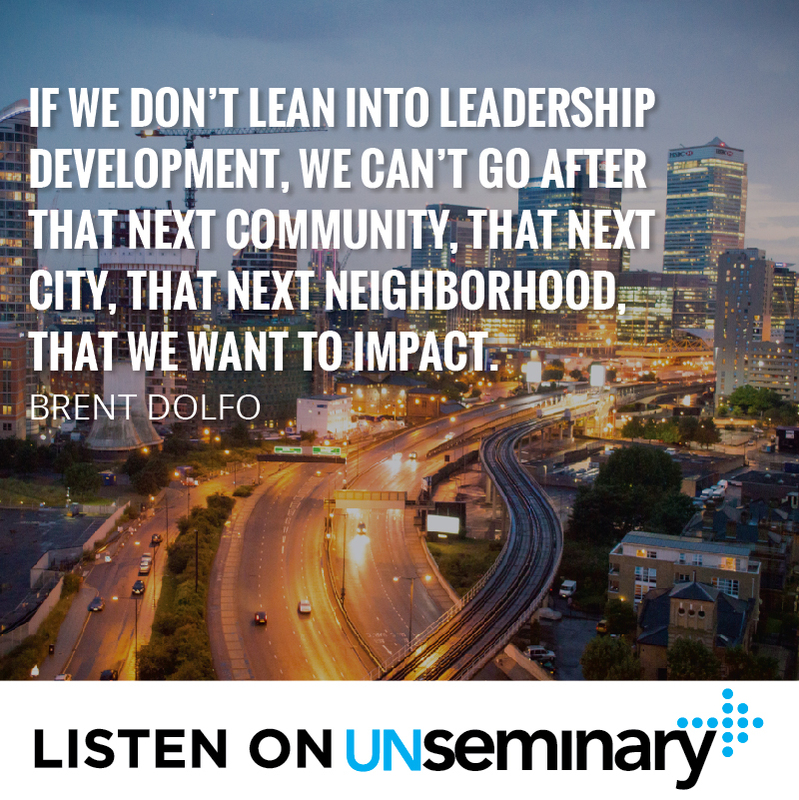 Now if you’ve been listening to the unSeminary podcast recently, we’ve been going through this run of really interviewing executive pastors, senior leaders from some of the fastest growing churches in the country and it seems like leadership development is a core theme at all of them. Churches that are making an impact have figured out how to develop leaders, release them, ultimately not just in their church but in the world around them. Obviously that’s been a part of what you’ve been wrestling through, that’s been a part of the story there. I wonder if you could give us a sense of some of the lessons you’ve learned as you’ve been interacting with leaders in some of these churches. Brent – Yeah and what I’ve been doing is, I’ve had six or seven cohorts of large churches, ten or twelve that will gather for two years together to work on creating an excellent leadership development and pipeline pathway and talk about all the elements that go into making that really work. The first one that we’ve discovered that’s really in question is what I would call ‘the why question’. They have developed a narrative by which, why do we need to develop leaders? Usually that narrative is around either we’re a multisite church, we want to plant more multisite locations, it can be where a church planting church wants to plant more churches, it can be that we really want to make an impact in our community and we don’t have enough leaders to do it. So everybody has sort of had this idea, multiplication or community impact or growth leads us to this crisis of, if we don’t develop more leaders we’re not going to be able to do all of that and because there’s this other narrative going on in the church which is more consumeristic, meet my needs, a develop program for our people. If you lose sight of the expansion or multiplication narrative, usually what happens is leadership development falls off the agenda. Rich – Now the why, is this, in the churches you’re seeing, more specific than just kind of the great commission sort of, we’re trying to reach everyone in the world? Brent – Yes it’s more particular to, here’s what we’ve been called to do, here’s the piece we own and that’s really stretching us and we don’t have enough leaders to do it and so if we don’t lean into leadership development we can’t go after that next community, that next city, that next neighborhood, that little middle school that we want to impact. If we don’t have enough leaders we can’t do that and no one’s going to produce them for us. They’re not going to show up on our doorstep ready to roll, we have to do that. So this crisis of scope, our scope is too big given the amount of leaders we have. Churches do a great job in leadership development, have a narrative that’s very personalized towards why they need to develop leaders. Rich – Very cool, make it really pedestrian, so it’s ready and take it up and run with it. Is there a church that’s kind of a shining example that they’ve done a really good job? I’m sure there’s a lot, obviously you’ve dealt with a lot of churches. Is there anybody that kind of jumps to the front of mind for you? Brent – Yeah I think the guys that I really would talk about would be the guys at Community Christian in Chicago, Dave and John Ferguson, The NewThingNetwork that hosts the Exponential Conference. Those guys have done a really good job of creating a passion within their people, in that, “We’re here to help people find their way back to God,” and there’s so many pockets around Chicago that people need to find God, there’s so many churches we need to plant in the world. So everybody grows up with this idea that the only way we’re going to get there is if we develop leaders with passion and giftedness and calling that can go and do those things and they do a fabulous job with that. Rich – Very cool. What’s another, so what are some of the other things you’re seeing? So really calling people into life more than just consumer Christianity and getting in the game so to speak. Then having a model by which apprenticeship looks like. Apprenticing isn’t a new concept but everybody knows what our model here is? What are the steps that we do here? It can be as simple as simply saying things like it’s going to be I do, you watch. Then the next phase is going to be I do, you help. Then the next phase will be you’re going to do it and I’m going to help and then you’re going to do it, I’m going to watch. Now I’ve apprenticed them into all the things necessary to lead at that level. So apprenticing, that apprenticeship model and calling people into that with ‘I see in you moments’ are critical to have a great leadership development culture in your church. Rich – Help me understand this. So I see that in so many churches, where apprenticing is core really to how they’re going to impact their culture, there’s this interesting, I would say conundrum, in a lot of churches where the senior leader, the person that’s leading the organization, the senior pastor, lead pastor, whatever, core to their function, typically not all the time but a lot of times, core to their function is like a teaching experience. A lot of times they’re the primary communicator for, it may be 30 weeks a year, the vast majority and there seems to be a lack or it’s harder to get that apprenticing going with that particular piece of what so many growing churches are trying to do. Obviously this pushes a bit of the succession issue, pushes a bit of that conversation. 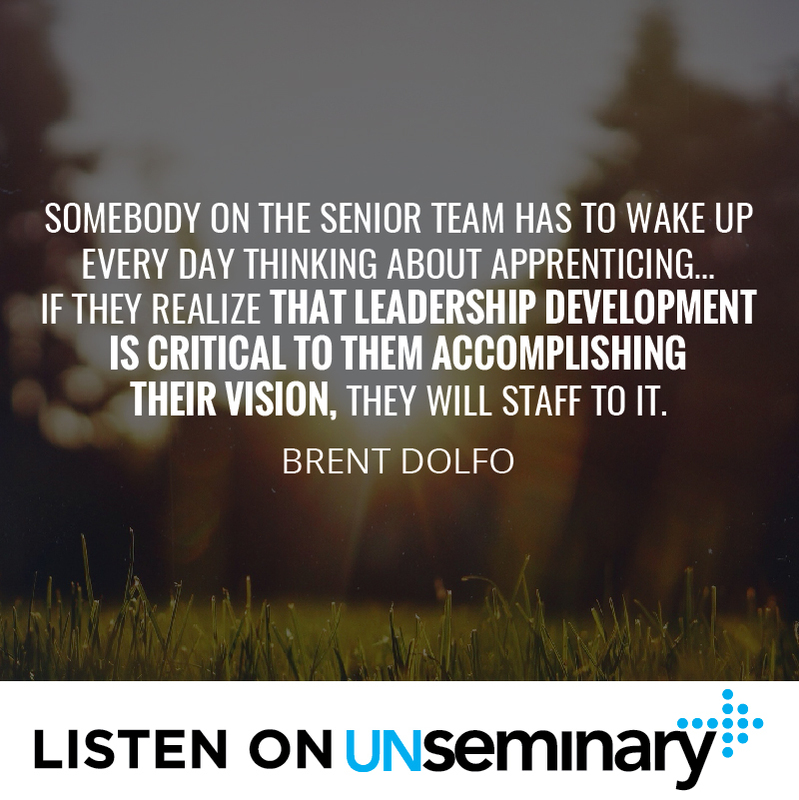 How are churches that are able to develop an apprenticing culture, how are the senior leaders in that able to articulate that in a way, when maybe their core function, teaching, they’re not doing that in? Brent – That’s an excellent question, a very excellent question and what we’ve discovered is, sort of the next principle, is that somebody on the senior team has to wake up every day thinking about apprenticing and developing that apprenticing and leadership development culture. So the high performing churches that are larger, that can afford to, have now someone on their lead team that’s in charge of leadership development and cross everything that they do. I would argue that a larger church needs somebody at least 70% of their job, is just developing that throughout the whole organization. Now the interesting thing that I’ve observed is people staff to what’s important. People staff to what’s important. So for the senior leader, even though his job maybe primarily communication and the executive pastor sort of managing the craziness of making everything happen, if they realize that leadership development is critical to them accomplishing their vision, they will staff to it and it doesn’t always need to be a fulltime person but somebody has to wake every day reminding everybody. If you think about strategic planning for a church, we plan how much money is it going to take, how many strategies we’re going to… but very seldom do we think about how many leaders are we going to need to get that vision done and who’s tasked to make sure that we stay on point on getting that piece of the plan done? That’s what excellent churches do because, as we all know, Sunday comes along with alarming frequency and the scream of just getting Sunday done and you’ve got to have somebody worry about this. The analogy that I use sometimes is a great major league baseball team and they have rookie ball, single A-ball, double A-ball, triple A-ball and they have somebody who’s in charge of the farm system. Brent – So as the church develops the mindset, as we’re developing leaders through all the levels of our pipeline, we’ve got to have somebody keeping their eye on that ball. Rich – Cool. Do you have time for maybe one more of the ten before we..? Brent – Yeah the other thing that I would say is that people have really worked through their leadership pipeline. Now some people don’t like that, they think it sounds mechanistic, but it can be pathway, whatever word you want to use. Brent – So here’s a question that I usually ask pastors. I say, “For those in your church that are leading a small group of leaders, a group of eight to ten people, what do they need to be great at, in your model, to be a great leader?” Most senior pastors give me kind of a blank stare like, “I don’t know.” I would argue that needs to be crystal clear, that if I’m serving in the first impressions team and I’m leading a small group, I’m leading youth ministry, I’m an usher, anywhere I serve, if I’m leading a small group of people, those key things that need to be true about me need to be true across the whole church and I would argue that 80% of leadership is the same in a church, 20% is just the context by which I do it. So I can’t build leaders with the end in mind if I don’t know what the end in mind is. I can’t build leaders unless I know what are the four or five key characteristics I’m trying to build into these people. Then you think about the next level of leadership, because typically a church has four or five levels of leadership. The second letter is, who’s giving coaching leadership to those small group leaders and what do they need to be great at? Again the blank stare. But for a church to actually work through every level of leadership, all the way up to the lead team, one of the four or five things they need to be really great at, a church cannot build with the end in mind. So churches that are doing a great job have done the hard work of staff alignment across departments that were all building leaders that have the same kind of end in mind. They may do different functions in terms of where they serve, but what they’re great at is the same. Rich – Yeah I think that’s a huge insight. That is a struggle in the churches I’ve served in where I think we get, as a church begins to grow, you can become siloed pretty quickly and you end up having, almost competing leadership development strategies across them. Brent – Well that’s one of the key roles of the person that’s in charge of leadership development for the whole church. It’s leading the alignment process so that everybody’s on the same page. A little story: Gateway Church in Dallas was in one of our groups and they talked about one of their problems when they got involved was, “If I served in the first impression team”, because they had their own leadership development, “and then I wanted to go into children’s ministry, I had to go and start at ground level again and do all the training from the beginning,” because everybody had their own training, just like you said. As they went through this they began to see, “What if our training, across all of our different ministries, is actually the same? Why are we not training leaders that 80% of their training is the same, the 20% of the context?” So leading the process where you get the staff aligned to the what and the how and then what happens is we’re now building with the end in line. But if you don’t have somebody who wakes up every day kind of helping connect all of those hoses and getting that process together, it’s really hard to ever get over that hump. Rich – So now how does leadership development or Leadership Network help with this? Obviously you’ve kind of intimated, you’ve got these groups. How else are you helping trying to lead the charge with churches on this conversation? So being in that environment where they can learn from one another’s models, because everybody comes into the process where part of the things they’ve got going really well and some of them they’re terrible at, some they’re just developing. So they get to learn from one another and we make they come with their lead teams, so that the decisions makers can actually decide what needs to happen and part of the process we bring some outside experts about the models that are doing a really great job and then we make them do a plan for the next six months, “Until we’re together, what have we got to work on to get on to get this done?” When they come back together in six months they actually have to report back on their progress. In between meetings I’d be coaching with each of the teams just to kind of make sure that they’re moving things along. So the idea at the end of the two years is that you’ve got everything done you need to get done, to have a great flourishing leadership development process. Now we’re switching things up a little bit, we’re starting something called The Hub, where we’ll have four or five of our topics together at the same time, we’ll meet three times to get this done. But that in essence is our process, open source learning, moving from implementation to impact. Rich – Very cool. Anything else you’d like to share before we jump on to the lightning round? Brent – Well let’s go to the lightning round. Brent – Hey one more thing. Let me just say one more thing. Brent – The one other thing that people do really well, that do great cultures, they begin to get some measures around leadership development. One of the metrics that you use to make sure you’re on track and a couple that I’ll mention just real quickly before we move to the lightning round. One is, I always tell people, think about what percentage of your current leaders have apprentices. That will tell you where you’re going to be in two years with the number of leaders you have. So if you can begin to measure that. The second one is, what percentage of your staff have you raised up from within? Because that’s a lighting indicator, that will tell you how well we’ve done in the past. So measures and keeping the scoreboard or the scorecard, if there’s something about leadership development that also really helps do a great job.